The Oct. 16 report in The Washington Post that Turkish intelligence blew the cover on an Israeli spy ring in Iran and exposed it to the local authorities is just the tip of a big, evil iceberg that looms over Israel and Turkey’s defense establishments. For dozens of years, Israel and Turkey, like close allies, cooperated in all areas of intelligence and security. Intelligence cooperation was close-knit and accurate. There was great trust between the parties, which yielded many mutually beneficial fruits. No more. The conciliation between Israel and Turkey, which was brokered by US President Barack Obama after immense efforts, is merely a veneer. In essence, there is no change. High-ranking Israeli security officials contend that the 45-year-old Hakan Fidan, who used to serve as special assistant to Turkish Prime Minister Recep Tayyip Erdogan, is a radical Islamist who maintains very close ties with Iran. His appointment as chief of intelligence was a watershed that marked Erdogan and his party’s full seizure of the country’s defense establishment. At first, Israel was unaware of this appointment. It was only in the wake of the Mavi Marmara flotilla events in 2010 that its intelligence services became aware of the fact that Fidan was heading Turkey’s intelligence services. Until that point, the working assumption in Israel was that Turkey’s intelligence and military remained independent and that a certain degree of cooperation could be maintained, even when Ankara was being hostile or standoffish. That’s precisely what happened after the Muslim Brotherhood rose to power in Egypt, where the formula actually worked. Egypt’s intelligence agencies continued to cooperate with their Israeli counterparts, and with greater force yet following the tacit agreement of the now-ousted Egyptian President Mohammed Morsi and his associates in Cairo. In Ankara, it turns out, things are done completely differently. Erdogan enhanced his grip on power, carrying out a massive purge of the military by sending dozens of generals to prison and not hesitating to appoint a close Islamist associate as chief of intelligence. 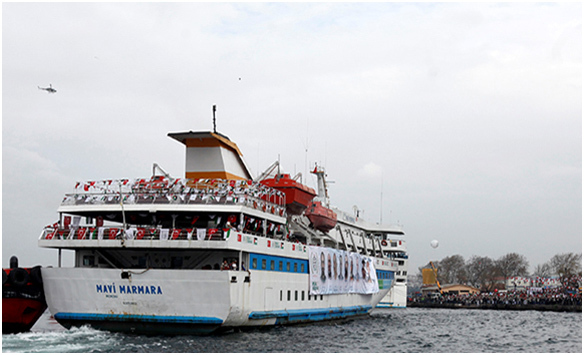 According to Israeli sources, the Mavi Marmara flotilla events unearthed the deep schism. Almost instantaneously, Israel realized that it had lost Turkey. Things will never be the same again. It is hard to believe that it was just a few years ago that Israeli and Turkish generals could have held intimate tête-à-tête consultations and even gossiped about their leaders. One of Israel’s former air force commanders received a perk from his Turkish counterpart by getting a “peek flight” along the Turkish-Iranian border. Another retired Israeli general told me last week about his productive working visits to Istanbul and Ankara, after which he would be hosted by his Turkish counterpart. The latter would take him sailing on a luxury yacht on the Bosporus. He would whisper a secret or two in his ear, perhaps even gossip about Turkey’s senior leadership and the independence of the Turkish military as the “guardian of democracy and the constitution” in accordance with the spirit of Mustafa Kemal Ataturk, deemed the founding father of the modern Turkish nation. Since then, Turkish Kemalism has been waning and has been on the defensive. Erdogan and his Justice and Development Party’s (AKP) grip on Ankara is tighter than it has ever been. The Turkish prime minister has engendered impressive economic growth, improving the quality of life for the masses. He has also learned the lesson from his predecessors who were vanquished under the boots of the military. Now he — and nobody else — is in control. The generals are either in prison or have gone underground or been tamed and put in their proper place. Having received the message loud and clear, Israel improved its relations with Greece and Cyprus, preparing other alternatives, despite the fact that in quite a few areas Turkey remains irreplaceable. It shares a long border with Syria, Iraq and Iran. This is a strategic asset of the first order. It also has efficient intelligence services, a huge army and large air and naval forces. Israel was a major supplier of technology, military materiel, weaponry and much more. It upgraded Turkish tanks and other weaponry systems. Most of these collaborations are long gone. What we have is a huge pool of bad blood. The reported event where an Israeli spy ring operating in Iran was exposed to Iranian authorities probably did take place. Official Israel, notwithstanding, maintains a roaring silence. Despite all this, if the report is correct, blowing the cover on an active spy ring and exposing it to Iran, cold-bloodedly, is considered in Israel to be a scathing transgression of a red line. Even the Americans, who were aware of the incident, viewed this as a severe violation of international codes between friendly nations. Ankara emphatically denies the incident via various spokespersons (chief among them Foreign Minister Ahmet Davutoglu.) So who leaked this story precisely at this time? There’s no telling, but we can surmise: It’s either Israel or the United States. It is against this backdrop that the Israelis who were opposed to conciliation with Turkey find it hard to conceal their broad smirk. Israeli Defense Minister Moshe (Bogie) Ya’alon was one of the opponents to conciliation in his previous capacity. Now, as defense minister, he is all for it. The only one who remains consistent in his objection is former Foreign Minister Avigdor Liberman. Omar Barghouti, founder and leader of the anti-Israel Boycott, Divestment and Sanctions movement, was denied entry to the United States on Wednesday. He was informed by airline staff at Ben-Gurion International Airport in Israel that U.S. immigration officials told the American consul in Tel Aviv to block him from boarding the flight. The US Capitol Building. Photo: Wikimedia Commons. Four of Israel’s most dedicated supporters in the US Congress on Friday expressed concern that the Jewish state may annex the West Bank, as results from Israel’s election earlier this week confirmed the likelihood of a right-wing government led by Prime Minister Benjamin Netanyahu. The final image sent by Israeli spacecraft Beresheet before it crash-landed on the moon. Photo: courtesy of Space IL. Astronauts and scientists at the US space agency NASA commended the Israeli non-profit organization SpaceIL for its efforts afyer its spacecraft “Beresheet” failed to land safely on the moon on Thursday. The lead article Thursday on the opinion page of the Frankfurter Rundschau newspaper compared Prime Minister Benjamin Netanyahu with the 1940 Nazi antisemitic movie The Eternal Jew. The article was titled in the paper “The Eternal Netanyahu” in a word play in connection with director Fritz Hippler’s antisemitic pseudo-documentary, based on the medieval legend of the wandering Jew, that served as a cinematographic justification for the Holocaust. As an orthopedic surgeon for 30 years in Washington, D.C. I see patients from all over the world and from every walk of life and what has become clear to me is that everyone is fundamentally the same. As a rule, I shy away from political or religious discussions with my patients as they have no bearing on their care. But occasionally, the discussions are thrust on me. Several years ago I treated a professor of political science from a local university and had established a good rapport with him. On his last visit before saying goodbye he popped a question. It is well-known by some and wholly ignored by others that Islam has a long, sad history of antisemitism, a bigotry that originated in the seventh century CE (the first Islamic century) and has grown more vicious in the 21st. Combined with an almost universal anti-Zionism and bolstered by many on the political “left”, it is today the most ubiquitous and deadliest form of Jew-hatred. It takes the form, not just of insults, boycotts, and lawfare, but of wars, terrorist attacks, and calls for the destruction of the Jewish state and the genocide of the Jews. Amman – The streets in Amman’s Jebel al-Weibdeh are crowded in the early evening with sounds of young people looking for a place to relax. Coffee shops intermix with art studios selling crafts for tourists. At the Maestro bar and restaurant, a band is getting ready for a live performance. The lights are dimmed and someone has put “no smoking” signs on the tables – they are out of place with the ash trays. Apparently, Monday has jam sessions and anyone can bring their instrument to join in. But it’s Wednesday. “Palestine” does not exist today as a nation-state, but at multiple times in history, including the present, it has been one of the names of a place. The Romans, recalling the defunct Philistines – non-Arab Sea People – coined it after defeating [Jewish general] Bar Kochba in 135 CE to disassociate what had been Judaea from Jews. President Trump’s peace plan for the Palestinian-Israeli conflict surfaced two years ago and to this day – remarkably – only he and a handful of aides know its precise details. A stream of leaks, however, contains enough internal consistency that their collation, supplemented by conversations with administration officials, provides a plausible outline of the plan’s contents. On March 31, a South Bend grandma brought her grandson to the hospital. The 11-month-old baby boy had been shot. His grandmother’s car had also taken fire. It was another early morning in South Bend. Around the same time, Mayor Buttigieg, was toting up the $7 million in donations from his charm offensive as his bid for the 2020 Democrat nomination got underway. The national media never bothered reporting the shooting of an 11-month-old boy in the city he was supposed to be running, but instead confined its coverage of South Bend matters to a publicity stunt wedding officiated by Buttigieg. The Palestinian students are being targeted because of their political affiliations and not because of any crime they committed. While the Palestinian Authority and Hamas are busy beating up each other’s supporters, “pro-Palestinian” activists on US and Canadian university campuses are busy blaming Israel for Palestinian woes. As an American Christian who has had the privilege of working in senior-level positions for four US presidents and who has enjoyed a close association with three of Israel’s prime ministers, I believe it is my obligation to provide the Israeli people with my views. I think my viewpoint is important because a vast number of American Evangelical Christians believe as I believe. In addition, Evangelical Christians are, without question, Israel’s strongest supporters in the United States. Does Case 3000 – known as the submarine affair – prove that Prime Minister Benjamin Netanyahu is guilty of doing something illegal? Well, all Likud supporters believe with absolute confidence that it’s a political plot. Netanyahu’s opponents, however, believe – also with absolute confidence – that it’s the largest corruption case to ever occur in the State of Israel. Did NYU president skip award event because of anti-Israel group?